Soon you could read all 309 pages of "Harry Potter and the Sorcerer's Stone" in under 77 minutes. Yes, you. To get through it that quickly (a pace of 1,000 words a minute) you'll have to use an about-to-be released app and forgo the idea of reading page by page. With Spritz, which is coming to the Samsung Galaxy S5 and Samsung Gear 2 watch, words appear one at a time in rapid succession. This allows you to read at speeds of between 250 and 1,000 words per minute. The typical college-level reader reads at a pace of between 200 and 400 a minute. Spritz goes all the way up to 1,000 wpm, but there isn't a visual for that yet. Spritz isn't the first to suggest reading one word at a time. Apps like Velocity show the reader one word at a time in quick succession, allowing for much faster reading. 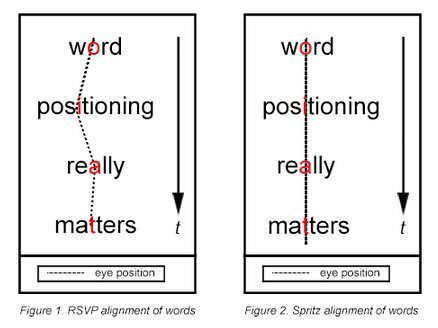 And another speed reading method, works almost the same way: Rapid serial visual presentation, or RSVP, has been around for years and has proven to be successful for many. The one-word-at-a-time technology is particularly good for smaller devices like smartphones and smartwatches. No more scrolling, zooming or pinching. Boston-based Spritz, which says its been in "Stealth Mode" for nearly three years, is working on licensing its technology to software developers, ebook makers and even wearables. Here's a little bit more about how it works: In every word you read, there is an "Optimal Recognition Point” or ORP. This is also called a "fixation point." The "fixation point" in every word is generally immediately to the left of the middle of a word, explains Kevin Larson, of Microsoft's Advanced Reading Technologies team. As you read, your eyes hop from fixation point to fixation point, often skipping significantly shorter words.